In the standard setup of Citus, it has one coordinator, so it is the single point of failure and the bottle neck of the system. 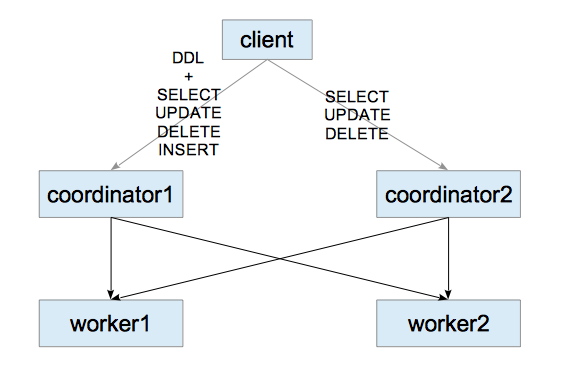 To solve these disadvantages, I built a multi-coordinator using Streaming Replication, which is the built-in replication feature of PostgreSQL. In this blog, I install and run all postgres servers: two coordinators and two workers, in a single host. Download the latest postgresql source code, and install to /usr/local/pgsql. Add the path /usr/local/pgsql/bin to the environment variable PATH. At first, create one coordinator and two workers. Create citus-sr subdirectory, and execute initdb command to create each database cluster. Execute CREATE EXTENTION command in each server. # psql -c "CREATE EXTENSION citus;"
# psql -p 9701 -c "CREATE EXTENSION citus;"
# psql -p 9702 -c "CREATE EXTENSION citus;"
Add workers to the coordinator1. # psql -c "SELECT * from master_add_node('localhost', 9701);"
# psql -c "SELECT * from master_add_node('localhost', 9702);"
# psql -c "select * from master_get_active_worker_nodes();"
Create the coordinator2 server which is a replication of the coordinator1. At first, create the coordinator2’s database cluster using the pg_basebackup utility. Next, edit the postgresql.conf and recovery.conf files where are located in the citus-sr/coordinator2 subdirectory. Create a table and define the distributed table of the created table on the coordinator1. If you access to the coordinator1, you can obviously do everything what citus can do. If you access to the coordinator2, you can execute SELECT commands. Interestingly, you can execute DELETE and UPDATE commands using the master_modify_multiple_shards function even if you access to the coordinator2. However, the master_modify_multiple_shards function is not efficient because it executes UPDATE/DELETE commands for all shards of the target table.